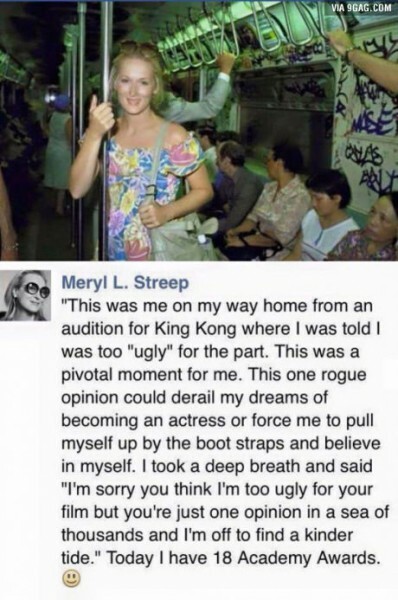 Meryl L. Streep Posted a POWERFUL Message on Facebook about Her Struggle with Being Too Ugly! 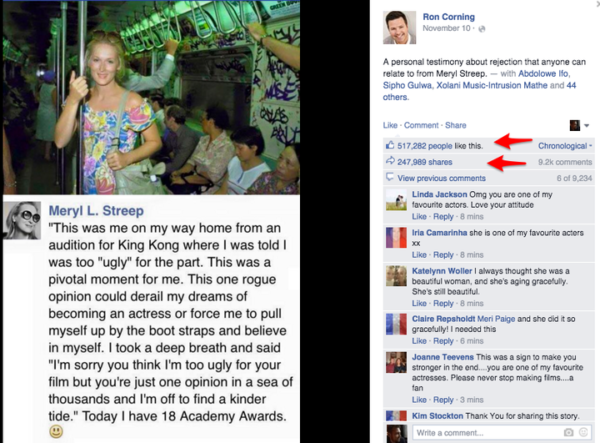 Not long after this post was published on Facebook the “Meryl L. Streep” community that posted it, disappeared. Supposedly because they had nothing to do with Meryl L. Streep. They were most likely a Hoax like most of the Facebook Pages. This TRULY happened to the actress Meryl L. Streep. And no doubt she struggled with something many of us do, with our image and the possibility that we may not look good enough. However, no matter if she posted this or not, the message is POWERFUL! Knowing her true story and looking what she has accomplished now is POWERFUL! We all struggle with the thought that we may be not good enough, in whatever way that manifests. But in the end the opinions of the world do not matter. What matters is what YOU think of YOURSELF! Period! All you will ever need is your approval! 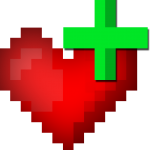 And this does not make you free from critique by default, but it simply makes your actions immune to that criticism. Like a wave that assertively drives towards its destination, no matter what happens around it. And when you make your dreams come true, none of those comments will matter AT ALL! Some may even transform into beautiful compliments. Because the truth is always in flax and it’s up to you to choose your own.